Dr Gui Wang's research interests are in titanium alloys and their processing, ultrasonic treatment of light metal, and FEA. Gui Wang is a senior research fellow at DMTC, school of mechanical and mining engineering. 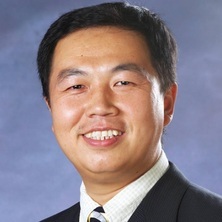 After obtained his PhD at Tsinghua University in 1994, he spent 6 years at the Beijing University of Aeronautics and Astronautics as a post-doctoral research fellow and then an associate professor in 1996 in the research group of near net shape casting technology of aircraft and aero-engine structures and rapid prototyping. He worked for QMI Solution as a research and development engineer when moving to Australia in 2001, senior engineer at advanced moulding Technologies and BoCAR Automotive. He joined UQ in 2008 as a senior research fellow. His primary research activities lie in micro/meso-scale manufacturing, Titanium alloys and processing for both medical and aerospace application, aluminium alloy solidification. Wang, Gui Material and Engineering. Beijing, China: BUAA Press, 1999. Zhenjun, Wang, Jingtao, Dong, Wang, Gui, Huan, Yu, Zhifeng, Xu and Dargusch, Matthew S. (2017) Preparation of 2.5D woven fabric C-f/Al composite and its tensile deformation behavior in warp/weft direction. Rare Metal Materials and Engineering, 46 12: 3744-3752. Liang, Dong, Liang, Zhu-yuan, Sun, Jie, Zhai, Qi-jie, Gui, Wang and StJohn, David H. (2015) Grain refinement of commercial pure al treated by Pulsed Magneto-Oscillation on the top surface of melt. China Foundry, 12 1: 48-53. Yu, Sen, Yu, Zhentao, Han, Jianye, Niu, Jinlong, Wang, Gui and Dargusch, Matthew S. (2010) Histocompatibility and osteogenic activity of Ti5Zr6Mo15Nb alloy with surface modification by porous TiO2 /HA coating. Jinshu Rechuli [Heat Treatment of Metals], 35 9: 31-36. Sen, Yu, Zhentao, Yu, Jianye, Han, Xiqun, Ma, Wang, Gui and Dargusch, Matthew S. (2009) Surface bio-modification by TiO2 film on TLM biomedical titanium alloy. Heat treatment of Metals, 34 3: 63-67. Wang, Gui, Yang, Li and Zhou, Tietao (2000) Modeling for evaluating the process ability of casting structure. Acta Aeronautica et Astronautica Sinica, 3: 222-225. Wang, Gui, Yang, Li and Zhou, Tietao (2000) Numerical simulation of temperature field for investment casting solidification process. Journal of Beijing University of Aeronautics & Astronautics, 3: . Wang, Gui, Chen, Bing and et al. (1999) Concurrent engineering and development of net shape casting. Special Casting & Nonferrous Alloys, 4: x-x. Wang, Gui, Zai, Shoubin and et al. (1999) Numerical simulation for high pressure die-casting process. Foundry Technology, 1: . Wang, Gui, Gu, Jin and et al. (1998) Study on the vacuum suction casting process for Al alloy casting. Special Casting & Nonferrous Alloys, 4: x-x. Chen, Bing and Wang, Gui (1996) Application of rapid prototyping technology. Aviation Production Engineering, 157: . Wang, Gui, Chen, Bing and et al. (1996) Numerical simulation of the stainless investment castings. Special Casting & Nonferrous Alloys, 4: x-x. Huang, Tianyou, Wang, Gui and et al. (1995) Study on indirect chills of heavy steel casting. Journal of Tsinghua University, 35 S1: . Wang, Gui, Dargusch, Matthew S. and St John, David H. (2016). Effect of Ultrasonic Treatment on The As-Cast Grain Structure during The Solidification of An Al-2Cu Alloy. In: The Ninth Pacific Rim International Conference on Advanced Materials and Processing. The Ninth Pacific Rim International Conference on Advanced Materials and Processing, Kyoto, Japan, (). 1-5 August 2016. Kent, Damon, Wang, Gui, Yu, Zhentao, Ma, Xiqun and Dargusch, Matthew S. (2012). Development of ultrafine and nano-crystalline grain structures during modified accumulative roll bonding of titanium alloy, Ti-25Nb-3Zr-3Mo-2Sn. In: Lian Zhou, Hui Chang, Yafeng Lu and Dongsheng Xu, Proceedings of the 12th World Conference on Titanium. 12th World Conference on Titanium (Ti-2011 ), Beijing, China, (2111-2115). 19-24 June 2011. Yu, Z., Ma, X., Wang, G., Yu, S., Sun, Q. and Damon, K. (2012). Microstructure and mechanical properties of biomedical near-β Ti alloy TLM with nanostructure by ARB process. In: Ti-2011, proceedings of the 12th World Conference on Titanium. 12th World Conference on Titanium, Ti 2011, Beijing, China, (2054-2058). 19-24 June 2011. Yu, Zhentao, Yuan, Sibo, Qiang, Huangfu, Yafeng, Zhang,, Wang, Gui, Yu, Sen and Jianye, Han (2008). Process, microstructure and mechanical properties of the novel near type biomedical Ti alloy. In: Proceedings of the 2008 MRS International Materials Research Conference, Symposium I: Biomaterials for Medical Applications. 2008 MRS International Materials Research Conference, Symposium I: Biomaterials for Medical Applications, Chongqing, China, (). 9-12 June, 2008. Dargusch, M. S., Dinnis, C. M., Savage, G., Schauer, N. and Wang, G. (2005). High Pressure Die Cast Aluminum Telecommunications Components. In: Cast Expo'05. Cast Expo'05, St Louis, Missouri, (). April 16-19 2005. Dargusch, M. S., Wang, G., Schauer, N. and Christodoulou, P. (2003). Manufacture of telecommunications components using high pressure die casting - a case study. In: A Dahle, Proceedings of the 1st International Light Metal Technology Conference 2003. Light Metals Technology Conference 2003, Brisbane, Australia, (75-78). 18-20 September 2003. Wang, Gui, Yang, Li and et al. (1999). Foundry production and concurrent engineering. In: Proceedings of the Investment Casting Annual Meeting of China. Investment Casting Annual Meeting of China, China, (). 1999. Wang, Gui and Shoubin, Zai (1998). Study on developing complicated casting in the concurrent engineering environment. In: Proceedings of Joint Young Scientists Conference on Manufacturing Science and The 3rd S. M. Wu Symposium on Manufacturing Science. Joint Young Scientists Conference on Manufacturing Science and The 3rd S. M. Wu Symposium on Manufacturing Science, China, (). June, 1998. Wang, Gui and Ren, Jingsong (1996). ProCAST-casting process simulation software application on the casting processing design. In: Proceedings of the Foundry Technology Annual Meeting. Foundry Technology Annual Meeting, x, (). 1996. Wang, Gui, He, Fuying and et al (1996). Temperature measure and numerical simulation of Al alloy investment net shape casting. In: Proceedings of the Foundry Technology Annual Meeting. Foundry Technology Annual Meeting, x, (). 1996. Huang, Tianyou, Wang, Gui and et al. (1995). A foundry molding sand expert system based on artificial neural network. In: Proceedings from Foundry 1995. Foundry 1995, x, (). May, 1995. Wang, Gui, Huang, Tianyou and et al. (1995). Application of artificial neural networks in foundry industry. In: Proceedings of the Foundry Technology Annual Meeting 1995. Foundry Technology Annual Meeting 1995, x, (). 1995. Wang, Gui and Chen, Bing (1995). Technology and application of numerical simulation of casting process. In: Investment casting Annual Meeting. Investment casting Annual Meeting, China, (). 1995.